I have a least favorite chore, laundry. Our washer and dryer is in the basement and with two boys I literally do laundry everyday. Before kids I never though that laundry was that bad, we had maybe 3-4 loads a week tops. Then my youngest arrived and the laundry started to pile up, and up, and up. After the arrival of my second son I decided that laundry was my arch enemy. Every time I washed something it just ended up being dirty again. Now part of the reason that we go through so much laundry is that I don't use paper towels. Instead I use cleaning rags and I clean my kitchen and bathroom top to bottom everyday. While that might seem extreme with three males in the house the bathroom would smell less than pleasant within two days, it's a must to have a full cleaning daily. The kitchen gets scrubbed since I cook and bake so frequently. If I don't stay on top of things in the kitchen it would turn into chaos. I also use separate washcloths and dish clothes when I do dishes each time (that's right no dishwasher in our house) so that adds to the mountain of laundry as well. Eventually my kids can start helping with the folding and putting away part of the mess, I am awaiting that day with glee. There is a theme in my kitchen this week - the slow cooker. Right before holidays I tend to make a lot of crock-pot meals. They save me time and money and I love them. Plus I can eat the leftovers again in a couple of weeks making less work for me after the stress of the holidays. This week I tried a new recipe for Slow Cooker Zesty Bean Posole from the December 2013 issue of Better Homes and Gardens Magazine. This recipe has 9 ingredients. It takes 3 hours and 40 minutes of total time, 10 minutes of which is active and makes 6 servings. I did make a few changes to the original recipe. First, since my kids were going to eat the recipe I used mild salsa. For the chicken broth I used homemade, which I don't salt, I salt at the table or in the recipe instead. I can't eat all-purpose flour so I substituted corn starch, which is a great gluten free alternative in soup and stew recipes calling for regular flour. I allowed the soup to cook or 8 hours on low in the crock-pot since I could start it in the morning and be done until dinner. For a dump recipe (most ingredients are canned) this recipe turned out very well. It was delicious and the flavors worked really well together. My husband and two boys really liked this soup. It was mild due to using mild salsa, which made the recipe very kid friendly. If you like your posole on the spicy side I would recommend using spicier salsa. 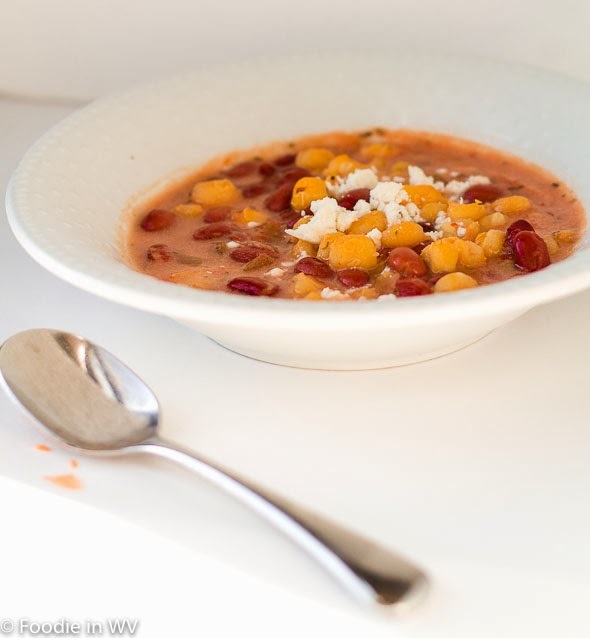 For the recipe go to Slow Cooker Zesty Bean Posole. A easy slow cooker recipe for posole, only 9 ingredients. Can be modified to be vegetarian by using vegetable stock instead of chicken stock. I don't love laundry, either, but honest to god, If I don't do it - it will literally never get done. We're going to have a house full of people here soon, and I'm thinking I'm going to run the crock pot all that week, just so I don't spend too much time in the kitchen and not enough time visiting. :) Your soup sound really good! I do it daily also and hate it :) We are going to have a full house in a couple of days also. I agree with you that I enjoy spending less time in the kitchen and the slow cooker is perfect for that purpose! I'm a big fan of bean soups too, especially in the fall and winter! This one is so easy too!